Colin Suckling has been Freeland Professor of Chemistry at the University of Strathclyde since 1989. During the 1990s until 2002, he served successively as Dean of the Faculty of Science, Deputy Principal, and Vice Principal of the University of Strathclyde. 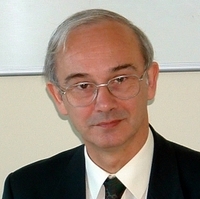 Much of Professor Suckling's work during that time was strategic including the development of inter-institutional and interdisciplinary research partnerships notably the research collaboration with the University of Glasgow (WestCHEM), which was recognized publicly with the award of OBE in 2006. Recent and current research interests focus on the synthesis and properties of heterocyclic compounds designed as molecular probes for biological systems or as drugs. Particular progress has been made in the field of fused pyrimidine compounds with anticancer and antiparasite activity and in the field of minor groove binders for DNA with antibacterial activity. Several discoveries are entering pre-clinical development. Professor Suckling's standing in the field of heterocyclic chemistry has been recognized by the award of the Adrien Albert Lectureship of the Royal Society of Chemistry (2009-10) and his appointment as chairman of the 2011 International Congress of Heterocyclic Chemistry to be held in Glasgow. Scott Fraser J., Nichol Ryan J.O., Khalaf Abedawn I., Giordani Federica , Gillingwater Kirsten, Ramu Soumya, Elliott Alysha, Zuegg Johannes, Duffy Paula, Rosslee Michael-Jon, Hlaka Lerato, Kumar Santosh, Ozturk Mumin, Brombacher Frank, Barrett Michael, Guler Reto, Suckling Colin J.
Anthony Nahoum G., Baiget Jessica, Berretta Giacomo, Boyd Marie, Breen David, Edwards Joanne, Gamble Carly, Gray Alexander I., Harvey Alan L., Hatziieremia Sophia, Ho Ka Ho, Huggan Judith K., Lang Stuart, Llona-Minguez Sabin, Luo Jia Lin, McIntosh Kathryn, Paul Andrew, Plevin Robin J., Robertson Murray N., Scott Rebecca, Suckling Colin J., Sutcliffe Oliver Brook, Young Louise C., MacKay Simon P.
"A disproportionate burden of the world's infectious diseases (both human and veterinary) fall upon the African continent. Among the most devastating of the infectious agents of animals are the trypanosomes that cause Animal African Trypanosomosis (AAT). Transmitted primarily by tsetse and other biting flies, the disease is present in 40 African countries and affects nearly all domestic animals. The overall economic losses attributable to AAT are estimated at $4.75 billion per annum. These are losses borne principally by those who can least afford them: small-scale subsistence farmers and rural communities in AAT-affected areas of large parts of sub-Saharan Africa who rely on livestock for their livelihoods. Current AAT control tools rely extensively on trypanocidal drugs for the treatment of infected animals and for prophylaxis of infection. The drugs are widely available but were developed over 50 years ago and have significant limitations in terms of safety and increasingly lack efficacy against emergent drug-resistant trypanosomes. Over ten million km2 of Africa are infested by tsetse flies and thus affected by AAT; this represents a substantial portion of Africa's fertile and watered land. Within this area, millions of small-scale livestock keepers rely on an estimated 55 million cattle and 70 million sheep and goats for their livelihoods and food security. These regions are under sustained and increasing pressure to produce more food for growing populations, increasing per capita consumption of meat and dairy products, climate change and desertification all combine to require increased agricultural output within the potentially productive areas of sub-Saharan Africa. Losses arising from AAT are both direct (e.g. estimated annual death of 3 million cattle) and indirect as a result of productivity losses (e.g. benefits of up to $7,000 per km2 from removing AAT). The net effect is a significant constraint on growth and development of the dairy and beef sectors, as well as sheep and goat rearing in the regions affected. Trypanocidal drugs are the mainstay in the control of AAT because of the absence of realistic prospects for vaccines. Vector control has had limited success and showed poor sustainability, the more so in areas where non-tsetse fly transmission is important (e.g. parts of Africa, but particularly in the Far East and South America too). The Global Alliance for Livestock Veterinary Medicine (GALVmed) was founded to help channel global efforts into amelioration of the burden placed upon the world's food security brought about by various infectious diseases. With substantial funding from the UK Department for International Development and the Bill and Melinda Gates Foundation, GALVmed has become the primary agency involved in efforts to bring new drugs forward to treat AAT. In this proposal, experts at the Universities of Glasgow and Strathclyde, and the Roslin Institute of the University of Edinburgh, are coming together to develop a new class of compounds that has been shown to have profound efficacy against the causative agents of AAT, both in vitro and in rodent models of the disease. Chemical structures of those compounds optimised for trypanocidal activity in cattle will be developed with the intention of taking them into clinical development. We will additionally develop new culture systems for the relevant parasite species - a crucial step for rapid and routine screening of our candidate drugs but also large sets of unrelated compounds (chemical libraries), with minimal need for tests in animals. We will also use state of the art biological and computational methods to learn about the internal functioning of the causative parasites, in order to understand how this new class of compound works. This part of the project will also provide key information to allow other classes of compounds to be brought forward, giving an important input to a long-term pipeline of new drugs to treat AAT." "The binding of small molecules and proteins to DNA is fundamental to biology and considerable scope exists for the development of highly-sequence-selective, DNA-binding molecules as new drug candidates and biotechnological tools to manipulate gene expression. In this proposal we focus on applying cutting-edge time-resolved spectroscopy methods developed at the STFC Central Laser Facility (CLF) to observe, in real time, the binding of small molecules to target sequences in the minor groove of B-DNA. Minor groove binding (MGB) species have shown promise as novel antibiotics for the fight against hospital acquired infections such as Clostridium difficile, with one such MGB compound, produced by our project partner MGB Biopharma Ltd, entering preclinical trials. Obtaining, a comprehensive molecular-level understanding of the mechanisms that underpin ligand binding in this class of molecules is now critical in order to inform refinement of current candidate molecules and the design of new derivatives for applications in areas such as cancer treatment. Despite much study however, key outstanding questions remain regarding the way in which specific DNA base sequences are identified by the ligand and the role of water in promoting, mediating or inhibiting ligand binding to DNA. The gaps in our knowledge arise because the current picture of DNA binding stems from experiments such as X-ray diffraction, NMR or biochemical assays that, crucially, are not sensitive to the rapid fluctuations of the DNA architecture or the solvent molecule-driven dynamics that occur in solution. These dynamics directly influence both the shape and chemical environment of the binding site and it is therefore imperative that they are built into any models of DNA binding. As a result of capital investment in ultrafast laser technology at the CLF and STFC-funded Programme Access research, the capability now exists for studying biomolecular processes in real time and at high spatial resolution using 2D-IR spectroscopy. We seek to establish that this technology can address key issues in the pharmaceutical sector by applying it to record the first 'molecular movie' of the DNA:ligand binding process of an MGB drug candidate. In doing so, we will reveal the influence of DNA fluctuations and water molecules upon binding in unprecedented detail and demonstrate that STFC-funded research can take a lead in transferring academic research to impact in this arena. The results of this work will demonstrably contribute to the design of MGB species for healthcare and we envisage integrating this new knowledge early into the drug design process, ultimately leading to next generation drug candidates with improved efficacy and selectivity for their particular target sequences. In addition, this demonstration of capability will provide a gateway both for future engagement between STFC research and the pharmaceutical sector and for exploitation of future funding routes from previously inaccessible sources such as MRC and the Wellcome Trust." The differing biological fates of DNA minor groove-binding (MGB) antibiotics in Gram-negative and Gram-Positive bacteria. "Antibiotics have been at the forefront of our fight against infectious disease since the 1940's. Since that time our reliance on antibiotics has been exposed by the rise of antibiotic resistant bacteria such as methicillin resistant Staphylococcus aureus (MRSA). Unfortunately, MRSA is not alone in its ability to resist the effects of antibiotics; other organisms such as Pseudomonas aeruginosa also have this ability. The World Health Organization considers solving the antibiotic resistance problem to be of global importance. One way of solving this problem is through the academic innovation of new antibiotic drugs to fight infectious disease. We have been studying a group of compounds called MGBs that have very high activity against MRSA. Very little is known about the biological basis for this activity and we will determine the mode of action of these new drugs. We hypothesise that MGBs interfere with the ability of MRSA to control the use of its genes during infection. We will identify which genes are most potently inhibited by our new antibiotics providing us with a detailed set of targets. This information will be used in two ways. Firstly, knowledge of the targets of our drugs will help us to design new compounds that favour particular genes. Secondly, knowledge of the mode of action of a drug is important for gaining approval to use the drug in clinical trials and ultimately, the clinic. Our previous research suggests that MGBs exhibit much better activity against organisms such as MRSA compared to Pseudomonas and E. coli. We hypothesise that this is because the latter two organisms are capable of expelling the MGBs from their cells using a system of pumps in the membrane. We will use cutting edge DNA sequencing technology to identify the resistance mechanisms of these bacteria and use this information to design new and better antibiotic MGBs to treat these infections in the future."